From professional Forex Trader & Trading Coach Akil Stokes. Each Monday & Thursday The Trading Coach Podcast shares helpful tips and inspiring stories aimed at helping aspiring Traders, Investors, and Entrepreneurs reach their goals. 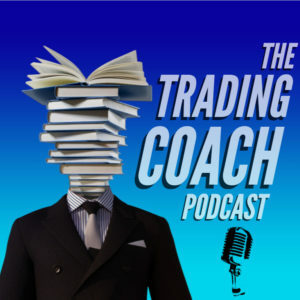 Voted 4th most helpful trader on Twitter and having a top 20 best trading Youtube channel, this podcast is yet another platform to help you through your trading journey and help you achieve your goal of becoming an independent and consistently profitable trader. Akil is THE ONLY reason I’ve gotten so far not only my trading career but in my professional career all together. He is by far among the best coaches out there. He is able to give his students the dry honesty they need to hear all WHILE motivating them. He always has a positive and inspirational message to offer. I first discovered Akil in early 2015 when I searched YouTube for “how to become a professional trader”. At the time, I was extremely dissatisfied with my job and living paycheck to paycheck. I wanted a career that afforded me for free time and with no one artificially limiting my earnings. I also hate being told what to do by people who have no idea how to do my job. Since discovering Akil, my trading knowledge accelerated greatly from being just a trader in video games only to trading a small live account. Sure, I am not the best trader (yet) and you certainly won’t know my name, but I am on my way to consistent and INDEPENDENT profits. Independent is the key phrase here. By learning from Akil, you will make your own way and stand on your own two feet. If trading is not your thing, this podcast is so much more than that. Take the lessons here, remove them from the trading and business context, and they become excellent life advice for anyone in any situation (sort of like how Akil’s method of reading a price chart works in any market on any time frame). It doesn’t cost anything, so you might as well check it out – I think you will be glad you did. I expect nothing but excellence from this podcast. I have followed Akil for roughly 4 years and I have seen his online progress so I’m definitely excited to see what he does with this podcast. Akil really knows what he’s talking about when it comes to trading. He’s lived through a lot of the mistakes and struggles that traders go through, so listening to his experiences and wisdom can help you to avoid the same mistakes. Akil is the truth, wonderful person and teacher. Hard worker, visionary, leader. Great future! This kind of information is priceless and Akil delivers it like no other. I am not an FX trader, but many of the principles of this podcast can be applied to other entrepreneurial endeavors. Consistency and following your plan are key. Keep up the great job!! Akil keeps it real about the difficulties in trading while also showing you how to overcome them to be successful. Great coach. An entertaining blend of professional insights and inspiring stories that cover all aspects of trading, investing, entrepreneurship, and personal development. Join Akil Stokes, a professional trader, entrepreneur, & globally respected trading coach as he delivers new episodes each week.